Once again I got my hands on a review copy of a book by Packt publishing. 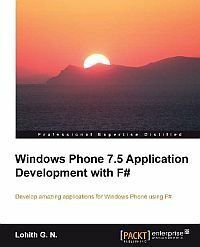 This time it was Windows Phone 7.5 Application Development with F# by Lohith G.N. I'm probably not its main target audience, being already an experienced Windows Phone developer and having only basic F# knowledge, but I have still enjoyed reading the book. Let me first point out that this book doesn't give you any introduction to F#. You need to have at least basic knowledge of the language to follow the book along. I don't think there's anything wrong with that, it's just something to be aware of if you're going to buy the book. Having said that, there's nothing all that specific to F# in the book either. All the samples could just as easily be written in C# and it wouldn't make much difference. Actually only the first two chapters focus on F# specifics, introducing you to F# templates, where to get them and what they include. If you're thinking about developing a Windows Phone application in F# this is bound to save you save time. The remaining chapters give a thorough overview of all the main concepts in Windows Phone development, illustrating them with very basic samples. It doesn't address the design aspect at all, though, so you'll need to get that knowledge elsewhere. All in all the book does a pretty good job in delivering what it promises. Too bad it doesn't really get into the advantages of developing an application in F# instead of in other more mainstream languages like C#. I see that as a missed opportunity of making the book appealing to a broader audience considering giving F# a more serious look. As it is I could really recommend it only to seasoned F# developers not knowing C# that well or not wanting to use it, who want to learn the basics of development for Windows Phone.